Pens make me happy. Especially when I know they are going to a good cause. I enjoy signing things and making notes with a thick nib pen, or fountain pen. 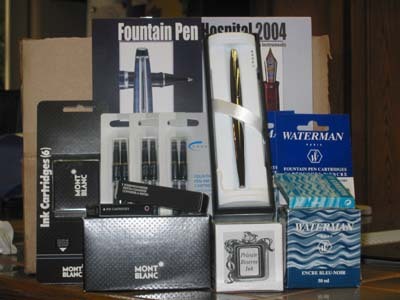 But for serious writing, nothing beats the BiC CryStaL GRIP (Writing Comfort) Medium Nib in black ink. This last week, I realised just how far behind my writing is. A few people I know have spent the last six or seven months editing their NaNoWriMo novels, and have got them ready to take advantage of a special offer to have a copy printed professionally. And once again, I have done no editing. Worse than that, I can’t find anything new I have written this year, apart from my Biblios Hokku project. I need a bit of motivation I think. c) If they are not well run, they can discourage, rather than assist. So here’s holding thumbs, and heading for the writing table.